The most surprising part about this trip so far has been the way people have been treating me. 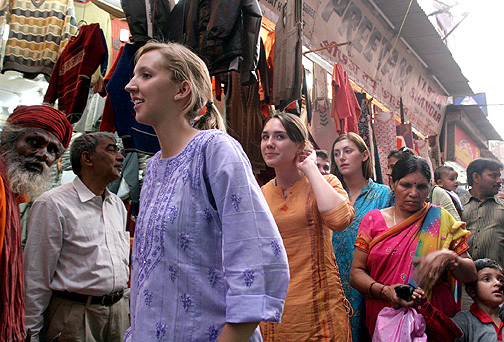 The way the people in Delhi looked at the group, like we were special, shocked me. We are not a spectacle, they are. It is amazing how little they have and are able to survive. Again at the orphanage the children looked at us like we were strange, yet they are so happy and friendly. No one I have met before has acted like them. Doesn’t that make them the strange ones, the spectacles? It is hard to describe the interaction between our two apparent spectacles. I had expected hesitation. There may have been a little, only visible in the slight stiffness of our actions. Soon even that was gone. It is hard not to relax when a little kid decides to sit on your lap and orders you in their little voice to teach them a game you play or to share with them whatever is in your hand. The difference between them and me is in the way we approach the unknown. I tend to watch and wait, proceed only once I have determined the way not to do harm. The children do not seem to wait or watch, but jump into the mess and try to sort it out with questions. Where I miss many beginnings, they are using the beginnings to skip right to the end where they already treat me like family. Their questions and actions make me feel like I have known them for as long as I have known the people in my class, although it has only been one day. I am grateful that they have been able to pull me out of myself and into the beginning of my stay with them. I have officially added another country to my list of homes. This update leaves my abode-like areas as follows: my various familial houses, Naveen’s house, and the Sri Ram Ashram. When you first arrive, the children are reserved in a relievingly polite way. Equally relieving, but much more entertaining is when this resolve is ruptured by familiarity and the children break into playful comfort. Merely hours into my stay the children no longer parted way for my passage, but rather mobbed me with questions and hugs. They have terminated their elegant silence, replacing it with a cacophony of laughter and loving chides. Seeing such radiant happiness is somewhat surprising considering the backgrounds that lay in their shadows. Sri Ram Ashram is, after all, an orphanage. How blissfully ironic, considering that this is among the strongest and most authentic families I have ever encountered. So utopian is this family that, should I live in India, I would want my child to grow up here. I want to be a child here. Fortunately for me, I have recently been indoctrinated into this family. They have made me part of their beautiful union, and I am forever grateful. Thank you brothers and sisters for the laughter, love, and happiness you have provided for me. The sun beat down on our face’s as we stepped out on a dirt volleyball court. This was it. The game SN has been waiting for: the Mount Madonna Hawks versus the Sri Ram Vidyha Mandir. 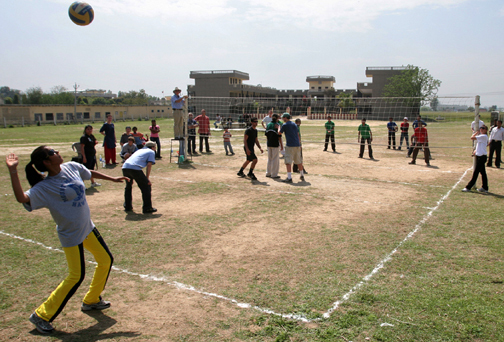 This was the time for the Mount Madonnians to show our true skill – volleyball. The game waxed on as our spirits soared. All the cheering in English and Hindi made us happy, and both teams played well. We made friends quickly as we mixed up teams. Everyone seemed so happy, even as we played in the intense heat of the sun. Somehow we were able to communicate in a haze of bad English and even more battered Hindi, as we tried to learn some of the native language. After leaving the volleyball court we went to play Frisbee and jump on the trampolines before we were asked to get ready for tea and then work. The kids were sad, asking us not to leave and to come back as fast as we could. I feel as if I have known these kids for much longer than one day, and surprisingly, here at the Ashram, I feel at home. 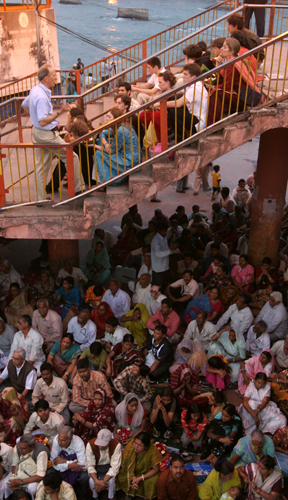 We got on a Bus from the Sri Ram Ashram and rode to Hari Ki Pauri to watch the nightly Aarti of Ganga Ma. Aarti is a celebration that occurs every night on the shores of the sacred Ganga river (known in the West as the Ganges). The belief behind the Aarti is that Vishnu stepped down to Earth, making a foot print in the river. 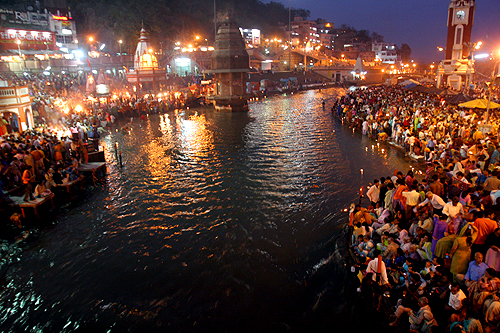 Therefore every night thousands of people gather at Hari Ki Pauri and take a bath in the river, believing they are washing away their sins as they do. Before making our way to the celebration at the river’s edge, we bought leaf boats filled with flowers and a candle. The boats carry a special prayer that will be sent out into the Ganga river, carried away by the current. As the celebration began, the air was filled with flames from hundreds of candles all lighting at once. As I was watching Aarti, a meaningful connection to the project came to mind. Watching all of the leaf boats float down the sacred river, a special prayer harbored in each one, I realized that our mission to India, our quest for Happiness, is very similar to that of the leaf boats’ journey down the river. We, like the boats, have been sent off with a special prayer by everyone who wants us to achieve great things. And, like the boats, our purpose and challenge is to stay afloat against the strong currents of challenge. As we get swept down the river of opportunity, we must ensure that we do everything we can to keep the flame of our journey alive. That burning flame represents all of the people that have helped us get this far, and by committing ourselves to the project with all our hearts, we honor them.